At the conclusion of last month’s Kamandi Challenge, Kamandi had fallen into the clutches of Dr. Vokolo, a lemur physician in possession of a 3-D “bio-printer.” Vokolo was willing to sacrifice Kamandi for the sake of saving potential lives in the future, a process that entailed removing the still-living Kamandi’s internal organs to be scanned. Alas, there was no plan to put them back when Vokolo was done with them, so things looked bleak for our hero. The tiger man Raja Maccao (“Mack”), whom Kamandi had earlier been traveling with (and who was already searching for Vokolo in hopes of finding a cure for a plague of “weeping pox” elsewhere), burst into Vokolo’s lab and was greeted by a sight out of an EC horror comic. “What have you done to Kamandi? 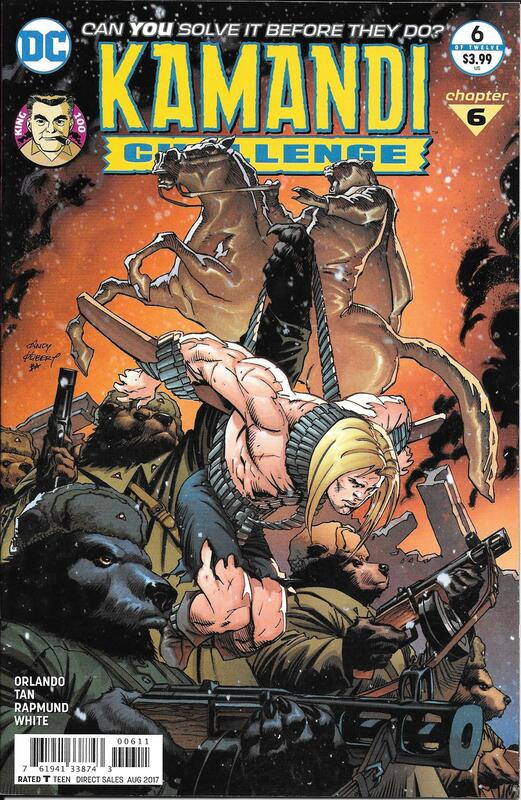 !” Mack demands as Kamandi Challenge number 6 gets underway. The good doctor explains what is happening, finishing with the ominous promise that “The only thing keeping your friend alive . . . is me.” So to motivate Vokolo, Mack shoots him in the gut, forcing him to use the “bio-printer” to save himself and Kamandi. 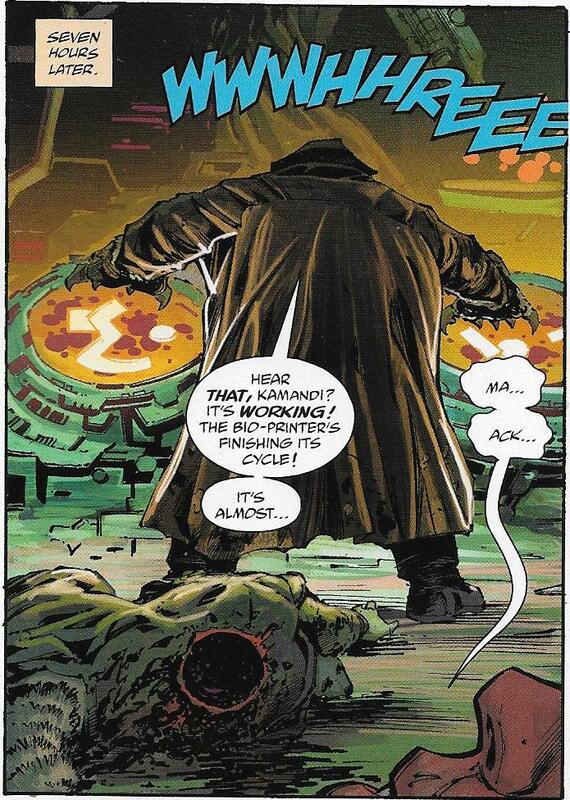 Well, actually, it takes seven hours to print the regenerative “gene therapy” that they eventually find in the computer’s records, but Vokolo estimates that he has only three hours to live after being gut-shot, so in the end he gets what was coming to him, and only Kamandi lasts long enough to benefit from the gene therapy. After Kamandi awakens, good as new, Mack chooses to stay behind and look for a cure for weeping pox among the late doctor’s resources. To help Kamandi continue his search for his people, he directs him to an old friend, a superhuman scientist named Renzi. 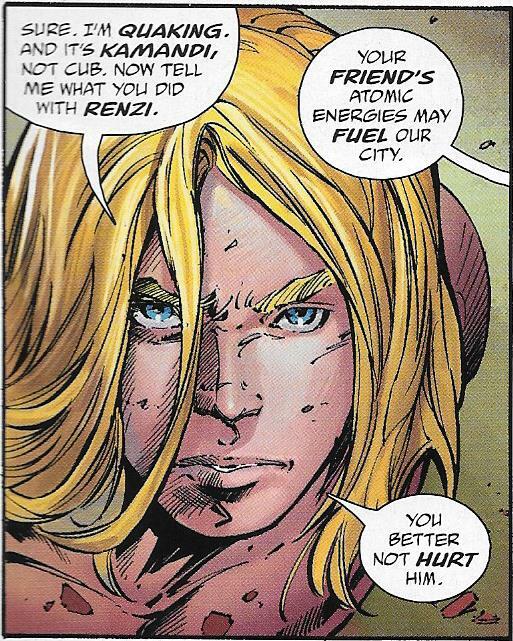 Renzi is a character from Jack Kirby’s original Kamandi series, but his appearance here is largely a cameo. 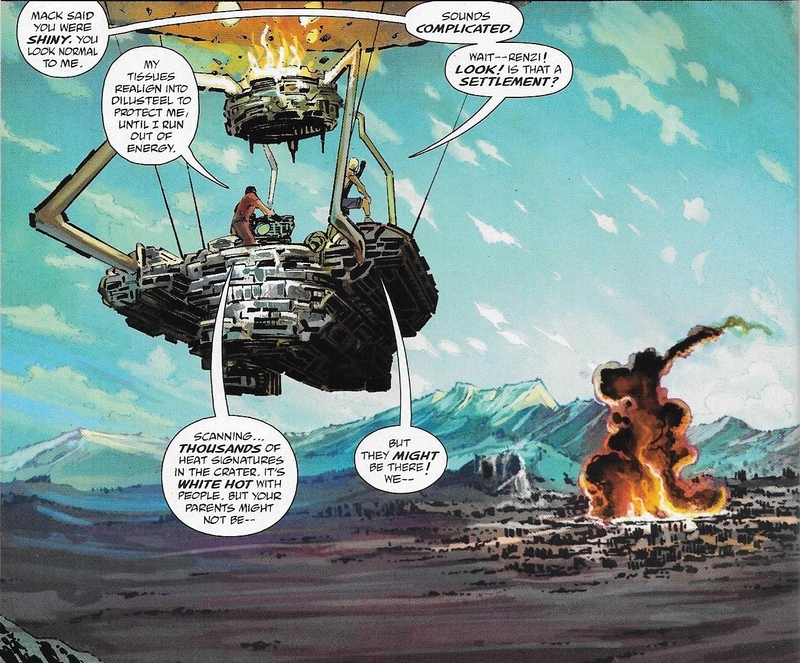 The pair are shown traveling by high-tech hot-air balloon just long enough to establish that Renzi possesses a “cyclo-heart,” an atomic energy source that allows him to change his body to a metallic substance for short durations, before they are shot down over an unknown source of intense heat. Renzi assumes his steel form to protect Kamandi, but both black out in the crash; they awaken in chains, the prisoner of intelligent bears. Renzi is separated from Kamandi: the bears have use of his cyclo-heart. 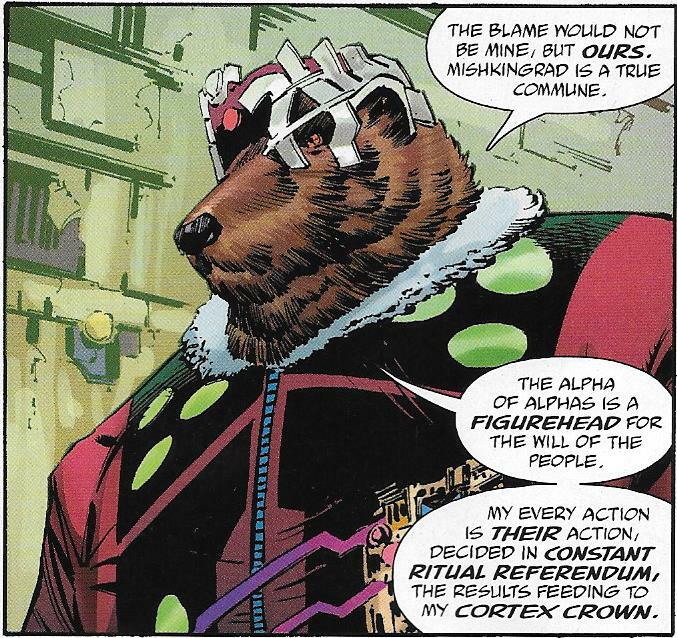 Kamandi is brought face-to-face with Groznovo, the “Alpha of Alphas”; Mishkingrad, the “God-Commune of the Bears” is a high-tech Soviet collective (because bears, get it? ), and Groznovo wears a crown that receives and tallies the collective decisions of the commune’s inhabitants, which he interprets and executes. His status as a channel for the will of the people is quite literal. Kamandi challenges Groznovo’s position, telling him that by being subject to the constantly shifting demands of the people he has merely chosen a different form of slavery, and is free of the burden of ever making his own decisions. Groznovo accepts this idea surprisingly quickly, and in fact lets Kamandi know that he has been tiring of the demands of duty for some time. If ever there was an opportunity for him to break free from the commune’s collective rule, Kamandi has presented Groznovo with it; the bear promises to lead Kamandi to where Renzi is being held. Throughout their flight through the city, Kamandi notices strangely anatomical references that go beyond the usual discussion of a city’s “bones”: the transit system is referred to as “vascular,” and so on. Near the end of this chapter we see just what Renzi’s atomic-powered heart is being used for: the “God-Commune” is a giant, self-contained city, but it is in the form an enormous, autonomous bear, and with Renzi’s heart as its reactor, it can generate enough power to get up and move about freely. Ultimately, Groznovo has been playing Kamandi: the bear truly wants to be free, but he will not betray the commune’s ideals. He has led Kamandi away from the furnace in which Renzi is being held captive. Kamandi accuses Groznovo of using him, and the pair fight as the bear-shaped city plods along, leaving flames in its wake. Groznovo makes it clear that in a choice between loyalty to Kamandi and his own people, he will always choose his people, and he reluctantly throws Kamandi overboard. Recalling the first chapter, Kamandi was brought up in a sheltered simulation of a typical small town, so one imagines that his schooling included American Government or Civics: like any student who has left school to strike out on his own, part of Kamandi’s story has been his disillusionment upon discovering that the world isn’t what he thought it was, and his subsequent discovery of his own power. His encounter with the communist bears is a test of his beliefs, but one too brief to really challenge them, and in effect the God-Commune is just another cruel domain ruled by an Other, an animal race that has taken one trait of human civilizations (collectivism) to an extreme.